World War II breaks out in Europe, but The Nation (getting it wrong) says it presents no threat to the US, and we will not join the fighting. This article appeared in the September 23, 1939 edition of The Nation. To all of us American correspondents over here it seems as if the United States were taking this war far more excitedly and tragically than the people of this country, whose amazing calm I have already stressed in this correspondence. We are told that various American admirals and generals have, as usual, burst into print to declare that the only lesson for the United States is that it must arm at once, still more. It must not be content with the $2,000,000,000 voted by the last Congress but must add another billion just as soon as Congress reassembles. There is certainly not the slightest reason for this unless the United States intends at once to enter the war. Actually, from the purely military point of view, the security of the United States has been increased by the outbreak of war. And the longer war continues, the safer the United States will be, if it ever was in danger. For with each day that passes, the exhaustion of the contestants will become greater—through the piling up of their debts, the sinking of their ships, the ruination of their trade, the steady impoverishment and demoralization of their peoples. But, I can hear the admirals and generals saying, what if Germany wins? Will not Hitler then promptly come over and conquer, us and South America? The answer is emphatically no. 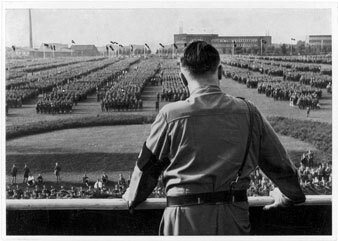 Hitler has not enough ships in the German merchant marine to move even a hundred thousand men with the necessary arms and supplies, and his navy is insignificant in strength in comparison to our own. If he wins, he will have an exhausted people, half-starved and ready to rebel at any suggestion of further conquest. And all Europe will have to be held down by huge German forces. Hitler certainly will not be able to take over the British navy and use it against us. He will never get his hands on it; any more than the English got the German navy at the end of the last war. If Hitler loses the war, there will have been removed the one country in Europe that could be considered an enemy to the United States. The only possible enemy remaining is Japan, which at the moment is so disgusted with Germany for betraying it that it will be less inclined than ever to start hostilities with us. And once more, for the hundredth time, I wish to stress the fact that Japan cannot physically make war upon us nor we upon Japan. On this page I have repeatedly quoted opinions of high naval and military officers to this effect, including the positive opinion of the commander-in-chief, Franklin D. Roosevelt himself, uttered when he was not in office and not in a position to indulge himself by playing with and commanding a huge fleet. Will somebody mention a third nation which might in any way menace the United States? Certainly both France and England will have been bled white if this war lasts any length of time; and Italy will never be in a position to menace the United States. And why should it? Its eyes are on Africa. It wishes to dominate the Mediterranean. It could no more attack the North American Colossus than it could undertake an expedition to the moon. Moreover, Mussolini, like Hitler, is a scoundrel who has to hold down his subjects by force. No, the truth is that if reason and logic, and not sentiment, hysteria, and self-interest, were applied to this question, the American army and navy would take the lead in advocating disarmament—always provided that we are not going to be so insane as to go to war in Europe again. I am even hoping that my friends the editors of The Nation will now turn about and join me in exposing the needless waste of the terrific military expenditures we are now making, to say nothing of the steady militarization of the country. I hope they will also give a great deal of space to recording the very important movement under way over here, led by the London Times, the Manchester Guardian, the New Statesman and Nation, and many distinguished individuals, to bring about a prompt statement of Allied war aims. If these aims are just, they will be the best possible propaganda to drop within the German lines. So far, every proposal that I have seen calls for the scrapping of the League of Nations and the building of a Federal State of Europe; it is believed that the continent cannot continue to live and develop in an atmosphere of crisis after crisis, war alarm after war alarm. In this the United States can help enormously, and it has already been suggested that President Roosevelt be asked to sound out neutral opinion everywhere on the form the new order should take. Here is a better opportunity for American leadership than any to be found in wasting more money on absolutely needless armaments. My fellow-countrymen can sleep in peace. They are not being got out of bed, as we are here, by the air-raid sirens, and there is not the slightest danger that they ever will be. They are not awaiting the inevitable destruction of life and property in the city in which they live. Let them be calm, and work for a new world and a decent one.